It was just over five weeks ago that I set off on this adventure. The Winston Churchill Memorial Trust advised me that this would be a life changing experience. That was clearly an understatement. It has been a long five weeks, full of learning, new experiences, new people and friends, and reacquainting with old ones. When I left Brisbane I quoted words from a John Denver song. Today is my moment, now is my story, I’ll laugh, I’ll cry and I’ll sing. Every day has been filled with so many emotions, and I have called this adventure an emotional roller coaster. I have laughed. I have cried, but I’ll leave it up to you to decide if I have sung. I seem to have lived a lifetime in these five weeks. I am slowly packing my bags to travel home. I cannot tell you which city has been my favourite. I have loved them all. They are all so different. There are differences in cultures, yet people are just people. One of the small differences I have noticed is that Australians judge themselves as “full of yourself” if you are confident, yet our way of self-deprecating is not looked at highly by the rest of the world. When I get home, other than coping with jet lag, I have to start preparing my Fellowship Report. Is Australia ready for my report? Will my suggestions be taken seriously? How can I help my industry? Prepare a lecture for APTTA Convention in October. Become a leader in my industry. This journey has reignited my love and passion for pianos, piano music and the musicians who play these beautiful instruments. I work for the musicians. I can be creative through my role in piano preparation. I am so lucky. The Fellowship has also shown me the people who care and support my endeavours. I have found so many people who really didn’t know me that supported my Fellowship and were excited for me. Some seemed jealous; but all I can say to them is apply yourself, as the Fellowship is open to all Australians. It has also shown me who my friends and supporters are. I judge people by their actions, and not the words they say. This research was titled “Selection and maintenance of concert pianos from the factory to stage”. I have learnt so much about the correct maintenance of these instruments, and I have found the selection process to be interesting. My taste in pianos is very similiar to every other technician I have discussed this with or have performed a mock selection with. I selected a concert grand in New York and have also ventured through the Hamburg factory to help select a piano for a customer. We all decided on the same piano within a few seconds of hearing the sound. I have also listened to other brands of pianos and visited another piano factory. It may seem strange why an employee of a Steinway and Sons dealership would go to the “opposition”. Every piano I have listened to or inspected has taught me something, whether it is a sound that I like, or just an appreciation of the workmanship and the sound on another brand. I have not endorsed any brand nor even given my personal comments on the brand I represent, however I leave the decision making to the either the pianist or the buyer. 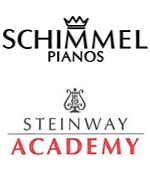 I cannot always work on Steinway pianos, and there will be times that I will work on other brands, so I need to know the characteristics of as many brands as possible. To limit myself to one brand would be immature. The Churchill Trust approved my itinerary to broaden my horizons across all brands of concert pianos, so I feel justified in all my decisions. So, I have to thank the many people who inspired me during these five weeks. Kent Webb from Steinway New York, Chris Blouin and Bruce Clark from Mason and Hamlin, Sara Faust from Faust Harrison Pianos, Louis Lortie, Ullrich Gerhartz from Steinway Hall London, Hartwig Kalb, Guenter Schmitt, Jan Hoeppner, & Jan Kittell from Steinway Hamburg plus all the names of the pianists that were displayed on the notice board every day. I also have to thank David Salmon and Mario Holmstrom who made the last two weeks in Hamburg so enjoyable. I also have to mention Pero and Zara from the canteen who tried to fatten me up plus all the employees of Steinway and Sons who made me feel so welcome. And a big thank you again to my referees, who without you I wouldn’t have been able to experience the best five weeks of my life so far. It is now my turn to pass on my lessons and hopefully inspire others. During my journey I have tried to link a subject or my thoughts to either music or a song. Germany was difficult as I could not find suitable music, and calling a post Brahms, or Concerto etc didn’t feel right. I have one more song I want to share as its title is suitable if there was another post. “I still call Australia home”. I can’t wait to see the the red kangaroo on a Qantas plane. However, you know the words, but there is one more verse for this post. Good on you Brian. Look forward to seeing you in October at the conference.